Tiwari said the BJP was resorting to abusive language as they had "no poll issue" and a "track record of non-performance". 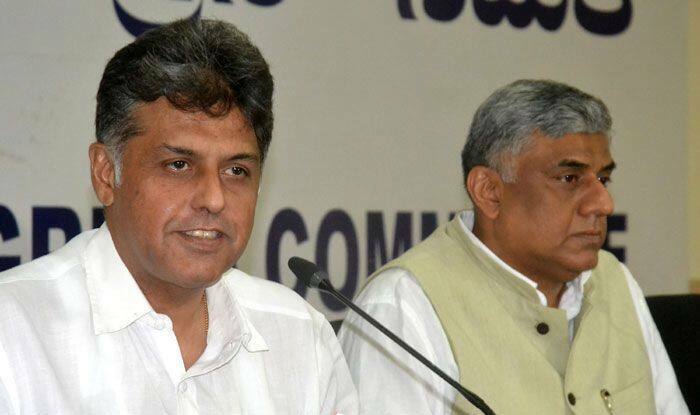 Senior Congress leader Manish Tewari on Tuesday slammed the BJP for attacking Congress president Rahul Gandhi with expletives. He said the Bharatiya Janata Party was resorting to abusive language as they had “no poll issue” and a “track record of non-performance” to campaign with for the ongoing General Elections. “The difficulty is that the BJP has no issue. They have no performance. So, how do you deflect the (public’s) attention? You indulge in abuse and rhetoric. People of India are not going to be misled. They are angry over the broken promises of the past five years and they will teach the Narendra Modi government a lesson in these elections,” the former Congress union minister said. Himachal Pradesh BJP chief Satpal Singh Satti had allegedly made a derogatory comment against Rahul Gandhi at a public event in Himachal Pradesh on Sunday, provoking strong protests from the Congress. Tewari, who is the Congress candidate from Anandpur Sahib, said the Lok Sabha elections are a “referendum” on the “non-performance” of the NDA government at the Centre. He accused the central government of destruction of institutions and no action to counter the agrarian crisis. Tewari, who had opted out of the 2014 Lok Sabha polls, is pitted against SAD candidate and sitting MP Prem Singh Chandumajra from Anandpur Sahib Parliamentary seat. The AAP has fielded Narinder Singh Shergill for the seat. Tewari initially applied ticket for Chandigarh seat. However, the party gave the ticket to four-time MP Pawan Kumar Bansal. “The issue in this election is the non-performance of the NDA government in which the Akali Dal has been a participant. The Punjab government was elected in 2017. Performance of the Punjab government will be assessed in 2022, which is at the end of sixty months,” Tewari said, when asked about state opposition members charging the Amarinder Singh-led government with reneging on poll promises. On his political rivals calling him an “outsider”, Tewari said the description was “absurd, preposterous and nonsensical”. “I have not come from Pakistan. What do you mean by outsider? Have I come from Pakistan? Punjab is such a small state and to label somebody an insider or outsider means you are bereft of real issues. I was born and brought up in Chandigarh. If we get into an outsider (debate), then Chandumajra is an outsider as he comes from Patiala. Why is he contesting from Anandpur Sahib,” he asked. He sought to assuage the sentiments of the Other Backward Classes community (OBCs), saying “they are part of the family” and they will be reached out to. On Monday, the Congress had expelled its spokesperson Gurwinder Singh Bali from the primary membership for six years for “anti-party activities”. Bali was reportedly upset over being ignored for the Anandpur Sahib ticket. The party’s representatives in the OBC community had threatened to field their candidate as an Independent, if their claim for the Anandpur Sahib seat was ignored. “The party is united. Yesterday, we went to Anandpur Sahib and the entire local leadership of the constituency, grass root workers, all the MLAs were there. So the whole party is united,” Tewari said.